James Willstrop, on his way to victory over Tarek Momen in Hull on Thursday. Picture: peterabram.co.uk. Three-time runner-up James Willstrop enjoyed success in his first ‘final’ at the British Open - leaving himself to face an even tougher test in the second round. Egypt’s world No 6 Tarek Momen was the man to suffer at the hands of Willstrop - ranked six places lower in the PSA rankings - failing to build on his good start to lose three games in a row as the 32-year-old Yorkshireman hit back to run out a 5-11, 11-4, 11-6, 11-7 winner. 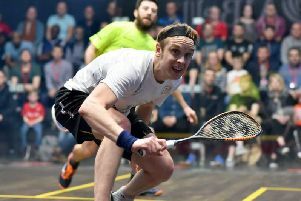 Another Egyptian now awaits Willstrop in the shape of world No 1 and defending champion, Mohamed Elshorbagy, who beat Switzerland’s Nicolas Mueller 11-7, 12-10, 11-4. “It was a brutal first round match,” said Willstrop. “These tough first rounds keep getting thrown up and it doesn’t make it very easy but you need to beat anyone at any time anyway. I approached it like a final because it’s such a tough game against Tarek. I put everything into it and I managed to pull out a performance because I had to play as well as I could today. Elsewhere, home hope Fiona Moverley was unable to make it through to the second round after falling at the first hurdle against defending champion, Camille Serme. The Hull-born 29-year-old produced a strong showing against the world No 4, before losing out 11-7, 11-6, 11-3 after 29 minutes on court.